Five years ago, the town of Conception Bay South, Newfoundland and Labrador, was facing problems with its privatized solid waste collection. Complaints were on the rise, and costs were headed in the same direction. In 2011, the town council voted to bring the service in house, ending 30 years of contracting-out. The CUPE local representing the town’s workers had worked tirelessly over the years to convince management and council that public worked best, first bringing bulk garbage pickup back in house, and building a solid case to end privatization once and for all. Now, at the end of a successful five-year in-house trial period, the service is staying public. The town-run service has also expanded to include curbside recycling pickup. “It’s a win-win for everyone,” says CUPE 3034 president Terri-Lynn Cooper. In a recent survey of town residents, garbage collection topped a list of what residents liked about their community, with nearly 82 per cent of people choosing the service first. 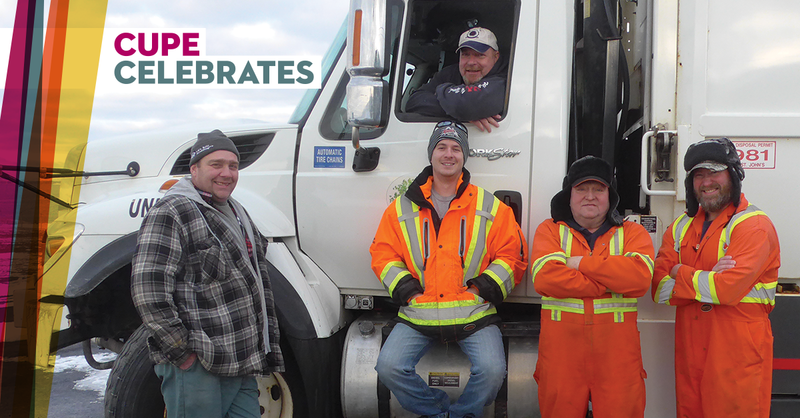 Increased service quality is a point of pride for the solid waste workers, members of CUPE 3034. In-house operation is also helping the solid waste crew improve their safety on the job. And town officials are also seeing the benefits of in-house control when it comes to accountability, flexibility and cost savings. The average yearly savings since bringing services in house are “significant,” says the town’s Chief Administrative Officer Dan Noseworthy, clocking in at about $230,000 a year to total $1.15 million over five years. With 25,000 residents, Conception Bay South is the province’s second-largest – and fastest-growing – community. The town’s in-house crew works the streets four days a week in distinctive white garbage trucks, picking up trash from about 10,000 homes. Some households use wooden garbage boxes, which can be a health and safety hazard. The boxes aren’t always at the roadside, they attract rodents and wasps, and can have protruding screws. As direct employees of the town, the solid waste crew is better equipped to address the ongoing issue of broken-down boxes and other hazards like bags that are overweight or full of sharp items. Under the contractor, workers didn’t have a direct line to town administration. When they didn’t pick up garbage because it was unsafe, town staff and homeowners wouldn’t know why garbage was left behind. Problems would go unsolved, which led to complaints. Now, with clear lines of communication and responsibility, town staff can follow up with property owners about problems, working with the in-house crew. “Every time I put in a complaint, the next week I go back and it’s all cleaned up,” says crew member Shawn Dillon. Being able to tackle unsanitary and unsafe garbage boxes is part of the difference in-house delivery makes. “Accountability comes with ownership and responsibility. When you have someone specifically responsible for that particular service, they own it,” says Noseworthy. “We’re better prepared and more willing to address occupational health and safety issues like garbage boxes,” he says. As a contractor, Corey Mitchell didn’t get paid sick time and other benefits he now has as a town employee. “Everything is better – wages are higher with the town, and benefits are better.” The town also supplies safety equipment, like proper boots, that he had to pay for before. Dillon has been part of the solid waste crew since 2012. He beams when he describes how it feels to be keeping the town clean for his neighbours, family, and community members. “It’s just excellent to be doing this,” he says. The pace of the work lets Dillon and his crewmates work safely and carefully. The in-house routes break the town into four runs, while the contracted-out service had three longer runs – and much more lifting. The tone for the town’s high service standards is set by the white garbage trucks that it bought when the service came in house. Painted white and emblazoned with the town’s logo of a child playing on a tire swing, the crew washes them at the end of every day. The contractor’s trucks were dirty and showed their age with leaks and frequent breakdowns that meant missed pickups, says Cooper. Former contractor Leo Power worked as part of the original in-house crew. The town’s trucks are “far superior” to the contractor’s vehicles, including a feature that lets the engine work as a brake. “We’ve got a lot of weight [in our trucks]. When you’re going downhill, you’re not picking up speed, you’re actually losing speed,” says Power. Buying new trucks meant fewer breakdowns and mechanical problems. Town mechanics maintain the fleet, another factor that boosts reliability and reduces costs. 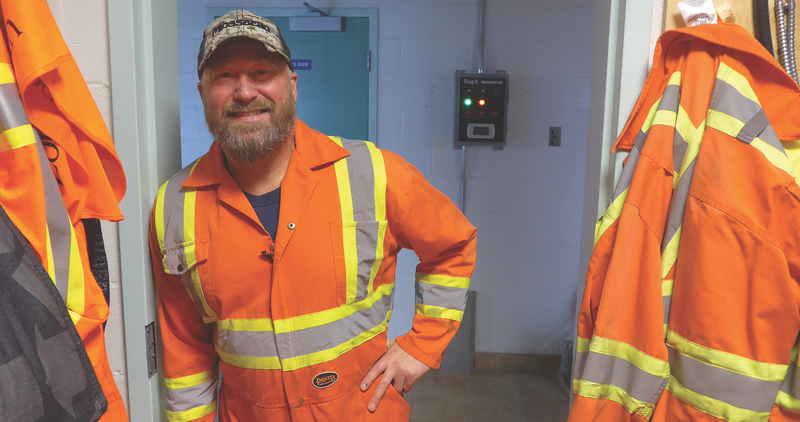 A four-day pickup schedule leaves Mondays for maintenance, and there’s room in the town’s service bays for other unexpected work, which means trucks get back on the road faster than with a private garage. After five years, the town is planning to start replacing its fleet. “The trucks are still going, but the mileage is up and every part is moving every day”, says Byrne. The town’s fleet renewal plans mean trucks will be retired before problems set in, a move Byrne says will save “a lot of money and a lot of downtime.” The town will keep the truck with the lowest mileage as a backup, ensuring reliable service even when one of the new trucks is off the road for maintenance. At the end of every collection day, a convoy of four trucks heads for the landfill in nearby St. John’s. Crew members work as a team - waiting until everyone’s finished their route before leaving. If one member’s behind, others who are already done step in to help finish the other route. “The hardest-working guys in this town work in garbage collection,” says Byrne.